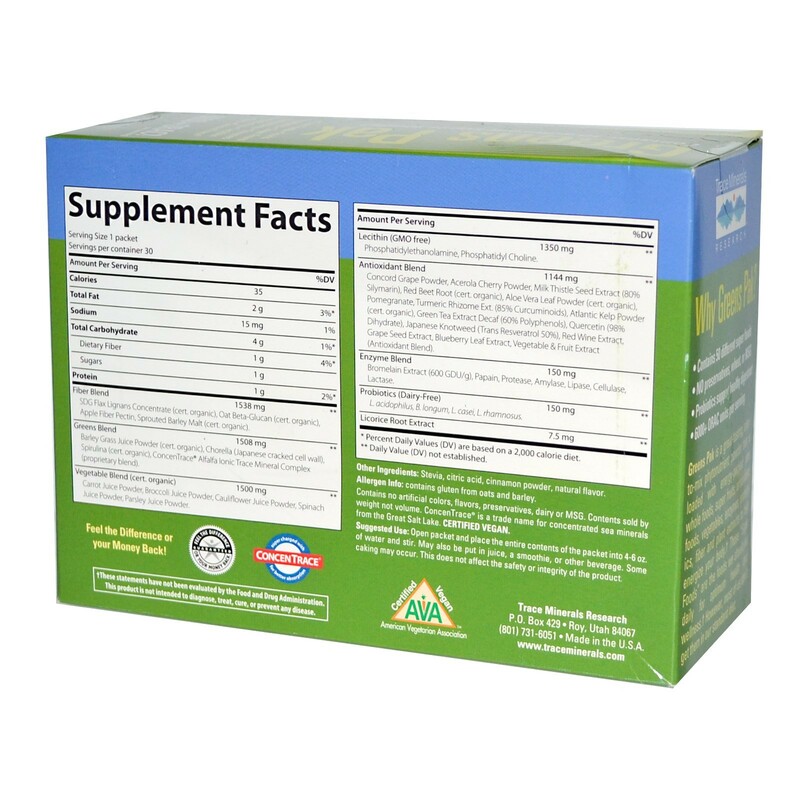 Greens Pak is a great-tasting, easy-to-mix phytonutrient powder that is loaded with energy-packed raw whole foods, superfruits, antioxidant foods, vegetables, enzymes, probiotics, fiber and plant extracts. Stevia, citric acid, cinnamon powder, natural flavor. Contains no artificial colors, flavors, preservatives, dairy or MSG. ConcenTrace is a trade name for concentrated sea minerals from the Great Salt Lake. Certified vegan. Contains Certified Organic Raw Foods! 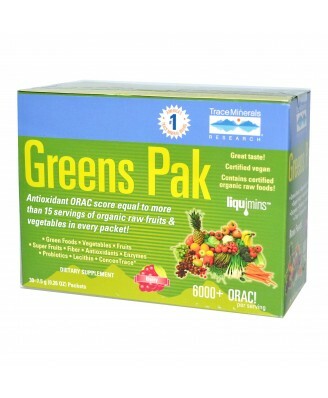 Greens Pak is a great-tasting, easy-to-mix phytonutrient powder that is loaded with energy-packed raw whole foods, superfruits, antioxidant foods, vegetables, enzymes, probiotics, fiber and plant extracts. These "Super Foods" are the foods we should eat daily. However, most of us don't get them in our standard diet. 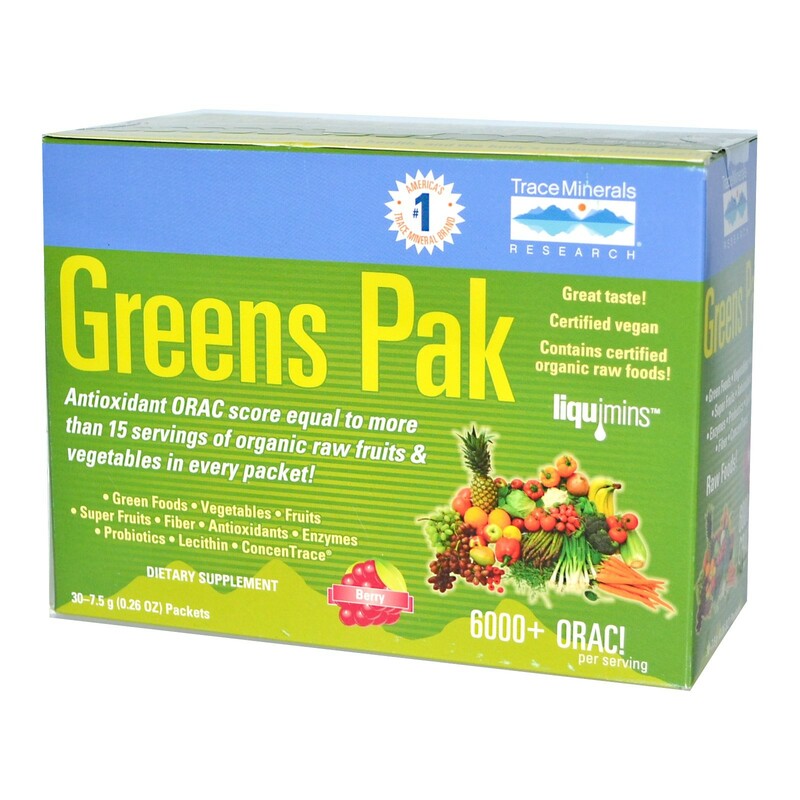 Antioxidant ORAC score equal to more than 15 servings of organic raw fruits & vegetables in every packet! Betaglucano de avena - betaglucano de avena se ha demostrado que disminuyen / reducen el colesterol en la sangre. El colesterol alto es un factor de riesgo en el desarrollo de enfermedad coronaria. Open packet and place the entire contents of the packet into 4-6 oz of water and stir. May also be put in juice, a smoothie, or other beverage. Some caking may occur. This does not affect the safety or integrity of the product.